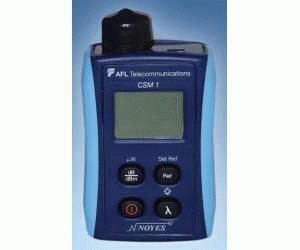 The Noyes CSM1 from AFL Telecommunications is a palm-sized, cost-effective optical power meter designed for measuring optical power in Premises, Telco, or Broadband fiber optic networks and for performing insertion loss measurements on multimode or single-mode fiber optic links. Weighing only 0.4 lb, this power meter is ideal for field use. The CSM1 stores optical references for each calibrated wavelength and features multiple test Tone detection for fiber identification. A large LCD display with backlight shows measured power [dBm or µW] or insertion loss [dB], calibrated wavelengths [nm], tone frequency [Hz], and indicates a low battery condition. The CSM1 optical input port accepts a variety of Noyes thread-on style adapter caps (ordered separately) to meet a wide range of testing requirements. One adapter cap, 2.5 mm Universal, is included. Being powered by two AA alkaline, the CSM1 offers a five-minute auto-off feature and over 300 hours of operation with backlight off.